Mentor Graphics is extending its industrial embedded systems offering with an updated multi-platform, multicore enabled portfolio. The market-specific portfolio includes familiar technologies such as the Nucleus RTOS, newer ones such as a tailored variation of the embedded heterogeneous multicore tools rolled out last year, and specific compliance to standards such as IEC 61508 (safety controller), Wurldtech Achilles communication certification and the proprietary Icon Labs security and automation controllers. 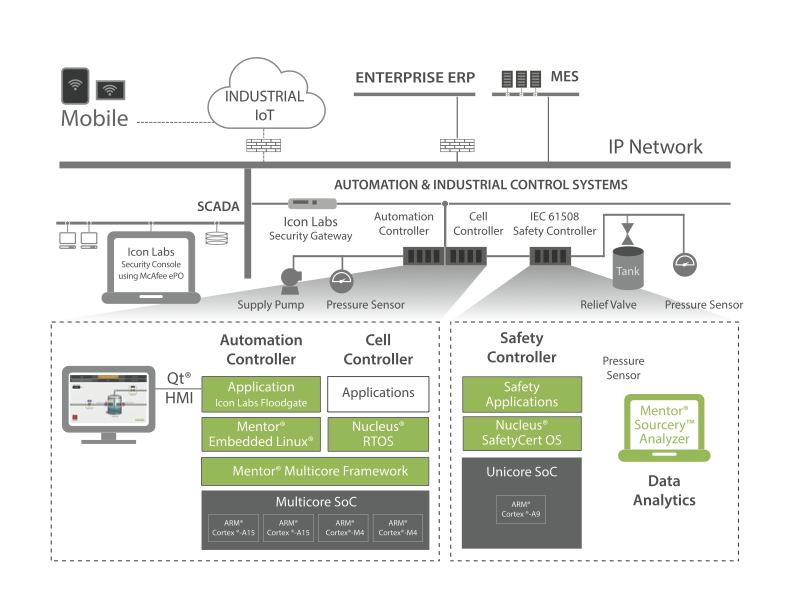 Target applications run the industrial embedded systems market’s gamut: industrial controllers, process automation controllers, PLCs, data acquisition devices, and motor driver controllers, along with motion, vision, and SCADA systems. The overall package is looking to tap into increasing machine-to-machine communication, advanced UIs and broader technology concepts such as the cyber-physical systems that underpin the idea of a fourth industrial revolution (aka ‘Industry 4.0’). Another way of looking at this comes down as ever to controlling capital and operational expenditure within the often megabudgets faced by industrial projects. Multicore has allowed far greater task integration and efficiency, for example, providing an opportunity for companies to cut costs at both levels, according to Warren Kurisu, Mentor’s director of product management for Runtime solutions. Other key cost-down drivers for industrial embedded systems include power efficiency, reliability, security and connectivity. So, with an eye to what the Internet of Things will actually mean for automation, key tasks addressed by the portfolio include the reduction of both power consumption – partly using Nucleus’ optimization features – and product downtime attributable to security vulnerabilities. The platform also includes a type-one hypervisor for efficiently separating and partitioning tasks, and the Sourcery Analyzer debug tool. Looking outward to the real world, the portfolio offers Mentor’s Qt UI graphics technology in a form optimized for industrial embedded systems control applications. The portfolio is being launched today (February 9) at the ARC Industry Forum in Florida. It is also expected to feature in Mentor’s line-up for EmbeddedWorld, later this month (February 24-26) in Nuremberg, Germany.